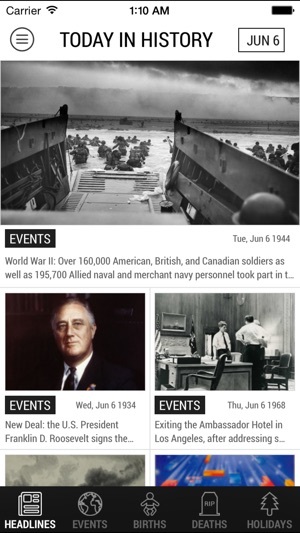 Santa Monica, California – Downshift LLC, an emerging mobile application development firm, has recently launched the latest version of their app, âToday in History.â The app lists historical events that took place on the same day. âToday in History makes it easy to be in touch with the great successes and failures of our past. The more connected to our history we are, the better positioned we are to make positive changes. Regardless of what generation we were born into, letâs remember the human attributes that have continually shaped and reshaped our world,â quips Manuel. Today In History 5.0.1 is currently free (With In-App Purchases) and available worldwide exclusively through the App Store in the Education category. Downshift is a California based mobile app development company that aims to bring simple, valuable and entertaining applications to the mobile application market. Developing mobile applications in the most creative manner helps us stand out from the rest. We believe in innovating every day and hence, coming up with creative mobile apps is part of our routine. All Material and Software (C) Copyright 2018 Downshift LLC. All Rights Reserved. Apple, the Apple logo, iPhone, iPod, and iPad are registered trademarks of Apple Inc. in the U.S. and/or other countries. Other trademarks and registered trademarks may be the property of their respective owners.